SSC CHSL Admit Card 2019: Staff Selection Commission releases a separate admit card for SSC CHSL Tier 1, 2 and 3 exams. SSC CHSL is all set to release the admit card for SSC CHSL Tier 1 exam in month of June. If you also have applied for SSC CHSL exam then you will get the direct link to download the SSC CHSL 2019 admit card on region wise official website or we will also upload direct link to hall ticket. . It is must for all the SSC CHSL exam applicants to carry their admit cards to appear in the exam. No candidates will be allowed in the exam center without admit card of SCC CHSL 2019 exam. Usually, the Staff Selection Commission releases the admit card for any exam conducted by then in proper of 2 weeks of the exam. Candidates can expect the admit card on the last month of June for SSC CHSL written exam. Exam date for the SSC CHSL are 01 July to 29 July 2019 & 29/09/2019. Online application submission process to continue till the 05 April 2019. Vacancy post Lower Division Clerk (LDC)/ Junior Secretariat Assistant (JSA), Data Entry Operator (DEO), Postal Assistant (PA)/ Sorting Assistant (SA), etc. If we analysis the previous record of SSC CHSL exam then according to that we can say, SSC may conduct the written exam of SSC CHSL Tier 1 in the month of July so SSC CHSL 2019 Admit card will be available for the applicants on the official website of SSC. Candidates can download the admit card to appear in SSC CHSL 2019 exam and take its print out for further use. To know the process to download the admit card to appear in SSC CHSL 2019 exam read the article further. SSC CHSL will upload the admit cards on its website state-wise. To download the admit card to get the right to sit in SSC CHSL Tier –I exam you will have to follow the below mentioned steps. Read them carefully and make a note of them to download your admit card. 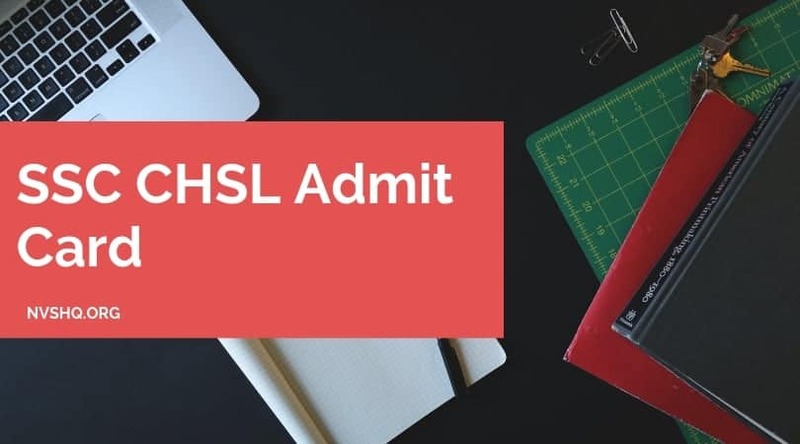 Step 1: First of all go to the official website of SSC CHSL.We have mentioned a direct link at the end of this article so the applicant will directly land at the official website and the admit card page. Step 2: After reaching the official website of SSC, applicants will have to type their registration id and password. Step 3: After entering the registration id and password, you will be directed to the admit card downloading page. Step 4: Click on the link, “Download SSC CHSL 2019 Admit Card”. Step 5: Take 2 print outs of your Admit card for use it further. Read your admit card carefully after downloading it. If you find any printing mistake or error in your admit card then contact to Regional/Sub Regional Office with the aforementioned proofs and your Id Proof. As we have mentioned above that your SSC CHSL hall ticket is a mandate document that you will have to carry to the exam center to appear in the exam of Combined Higher Secondary Level conducted by SSC. But along with your admit card, you would need to carry following documents for your identification in the SSC CHSL exam center. If you forgot your registration Number or Registration Id then you can recover it. To recover your registration id, you will have to click on ‘Forget Registration and Password’ tab and enter the details like name, father’s name and date of birth. Once you will enter all the asked details correctly, your registration id will appear on the screen of your computer. The process to recover the registration id and roll number of SSC CHSL exam is easy but it would be better to keep a copy of application form with you to save you from all these issues. Here in the section of important links, we have mentioned all the essential links of SSC CHSL 2019 exam. All the information related to SSC CHSL Exam and admit card are just a click away from you. As the exam conducting authority, Staff selection commission hasn’t released the admit card for CHSL 2019 exam, so the links will land you to the official web page of Staff Selection Commission for your region. As soon as admit cards for SSC CHSL exam will be announced by the SSC, we will update all the links for your feasibility. Staff Selection Commission has already released the notification for the SSC CHSL exam on 5th March 2019 to recruit suitable candidates on the post of Lower Divisional Clerk (LDC), Junior Secretariat Assistant (JSA), Postal Assistants (PA) and Sorting Assistants (SA) and Data Entry Operator (DEO). Online application submission started for SSC CGL 2019 exam from 5 March 2019 and it will continue till 5 April 2019. So if you haven’t applied yet for SSC CHSL then still you can apply for the SSC CHSL 2019. Take a print out of your application form after submitting it as if you face some issues in getting the soft copy of admit card for SSC CHSL exam then this application copy will be your savior. For more details, read the below-given information. We have given all the details associated with SSC CHSL Admit card and exam 2019 here with the important links to download the admit cards. If you face any issues in downloading the card then you can write or contact the Regional/Sub Regional Office to get the solution to your problem. Or mention it below in comment section.